Fact: A New Zealander cannot become Head of State for New Zealand, and an Australian cannot become Head of State for Australia. The Head of State for both countries is the reigning British monarch. 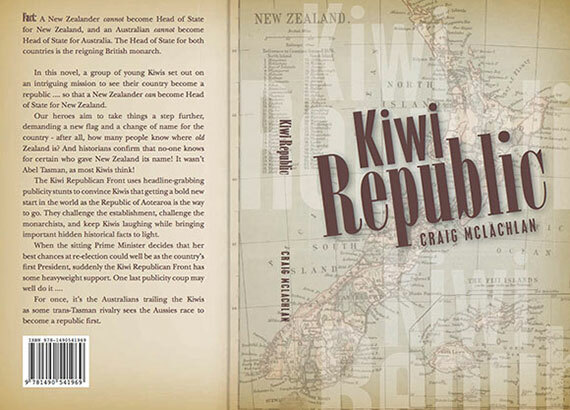 In this novel, a group of young Kiwis set out on an intriguing mission to see their country become a republic …. so that a New Zealander can become Head of State for New Zealand. Our heroes aim to take things a step further, demanding a new flag and a change of name for the country – after all, how many people know where old Zealand is? And historians confirm that no-one knows for certain who gave New Zealand its name! It wasn’t Abel Tasman, as most Kiwis think! The Kiwi Republican Front uses headline-grabbing publicity stunts to convince Kiwis that getting a bold new start in the world as the Republic of Aotearoa is the way to go. They challenge the establishment, challenge the monarchists, and keep Kiwis laughing while bringing important hidden historical facts to light. When the sitting Prime Minister decides that her best chances at re-election could well be as the country’s first President, suddenly the Kiwi Republican Front has some heavyweight support. One last publicity coup may well do it …. For once, it’s the Australians trailing the Kiwis as some trans-Tasman rivalry sees the Aussies race to become a republic first.